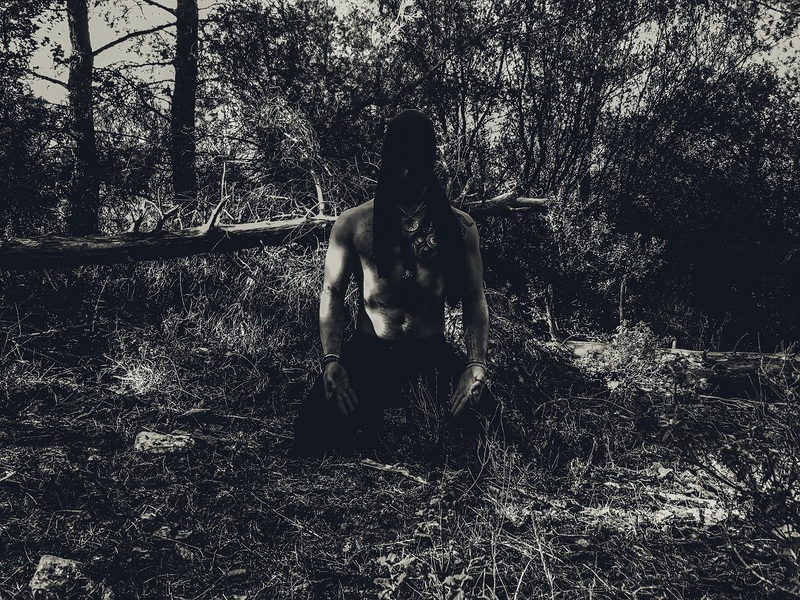 Shibalba are a ritual dark ambient act out of Greece. They quickly caught on in the scene, releasing splits with the likes of Phurpa, Alone In The Hollow Garden and Emme Ya. But even before these splits, Shibalba hit the ground running with their debut Memphitic Invocations which was originally released on Night Birds Records. 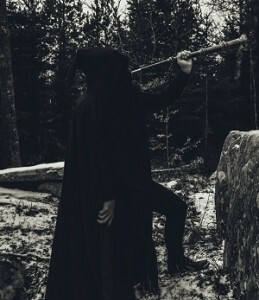 Memphitic Invocations showed a side of ritual dark ambient music a bit different from the style of many artists under that banner. 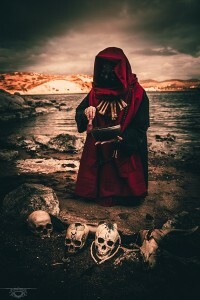 Where many artists seek to use elaborate droning textures to invoke a ritualistic atmosphere and alter the thought processes of the listener, Shibalba took a more literal approach to the art form. Using ritualistic drums and vocal incantations Shibalba delivered what amounted to an actual ritual in real-time. Shibalba, taking their sound on the road, proved to have a noteworthy live performance. Frontman Acherontas V Priest was already an adept at the live show, through his more well known black metal project Acherontas. So with each performance, Shibalba further spread their message and their brand to an expanding orbit of listeners. By 2015 this growing popularity lead them to release their sophomore effort, Samsara, on the venerated Malignant Records. Samsara showed an evolution in the sounds of Shibalba. Yet, the album did not break the mold of Memphitic Invocations. It was more a honing of their talents, a condensing of what worked for them. This made Samsara yet another success for the group. Not long after that release, they were already pushing a vinyl version, a format which Shibalba seems to favor. Even more live performances and the consumption of Samsara brought Shibalba to their current home, on Agonia Records. At the first announcement of their joining Agonia, I’ll have to say I was a bit perplexed. Agonia Records deals in the styles of rock and metal, so imagining a ritual dark ambient group’s placement in these circles seemed a bit out of the ordinary. 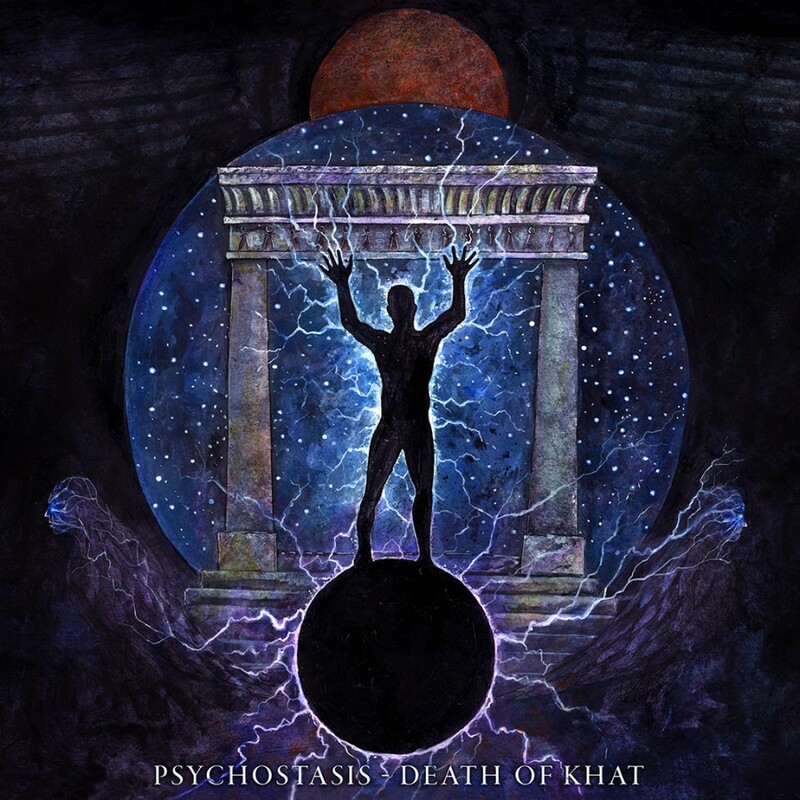 Of course, that was only until I heard their new album Psychostasis – Death of Khat. Psychostasis – Death of Khat takes Shibalba into a wholly different place, the album is considerably more ambitious than any of their previous works. The opening title-track seems to shed the dark ambient aspect of their sound almost completely. If there could be any comparison of this style to another dark ambient project, I would only be able to point toward several tracks by Herbst9, though to be clear, I do not consider this to be a copy of the Herbst9 style at all, I merely mention them as a means of illustrating the direction the some of the sounds of Shibalba have taken. Acherontas V. Priest uses spoken word as well as ritual chanting much more frequently than in the past. Ritual drums become more prominent. In general, the tracks take on more of a traditional song structure. However, when I said before that the dark ambient elements seemed to be completely shed, that (thankfully for me) proves to not be the case. 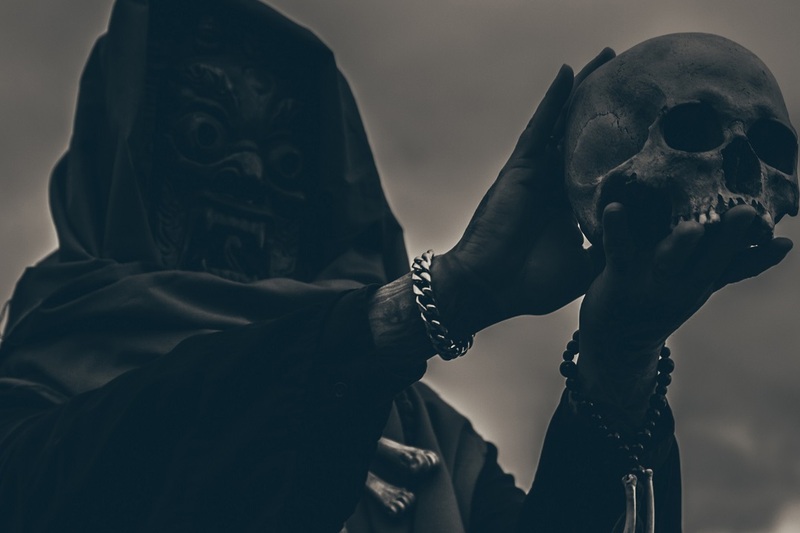 We need look no further than the second track on the album to hear these dark ambient elements come back into play. “Ihag Mthong”, much like many tracks on Samsara, has that hollow rushing windy atmosphere, which makes the listener imagine Shibalba performing their rites in some deep cavern of a dormant volcanic mountain. The chimes ring out reverberating off the walls, the deep bassy ritual drums echo and rumble the floors. It all seems to be building up toward a climax which won’t be reached until the following track “Kaoshiiki Mahayana” kicks in. “Kaoshiiki Mahayana” is a highly active track. There are a plethora of sounds overlapping one another here. Acherontas V. Priest bellows his chanting vocals as drums beat, chimes ring out, bass rumbles the floors, drones woosh in and out. By two and a half minutes into the track, there seems to be the feeling that some extraordinary spirit has been successfully conjured from its slumber. Following this climax the second half of the track begins to have a sort of mind-altering feel. Bringing the listener along to experience the same ecstasy felt by the attendees of the rite. On a track like “Aether Ananda Aiwss” we again get that vibe that was present on the opener. This track feels quite musical in comparison to much of Shibalba‘s work. There is a pronounced drum beat, guitars and bass that have an eastern religious feel. Yet, just as these melodies and beats start to sink in many of these elements evaporate. As Acherontas V. Priest makes another invocation the atmosphere begins to warp and swirl again as he makes contact with the gods. Psychostasis – Death of Khat clearly shifts from much of the previous Shibalba catalog into totally new territory. Their move to a label focusing on rock and metal acts seems to fit their shift in style. Yet, they still manage to retain the energy and mysticism that made Memphitic Invocations and Samsara so successful. They will surely attract a whole new crowd of listeners to their sounds. While, from my perspective, they shouldn’t alienate their oldest and most dedicated supporters that followed Shibalba from its birth. I would recommend Psychostasis – Death of Khat to any previous fans of Shibalba. I also think there is a big enough shift in their sound to attract readers whom may not have previously found Shibalba to be their thing. Whether they will stay the course with this new style, return to their previous frameworks or evolve yet again into something wholly new for their next release will be any one’s guess. In the meantime, Psychostasis – Death of Khat should give us plenty to enjoy for the foreseeable future.